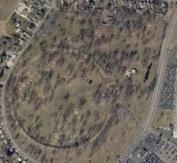 The Newark Earthworks are the largest set of geometric earthen enclosures in the world. The Great Circle Earthworks: Formerly known as Moundbuilders State Memorial, is nearly 1,200 feet in diameter and was likely used as a vast ceremonial center by its builders. The visitor center and picnic areas are located at 455 Hebron Rd., Heath, OH 43056.